Stephen Williamson: New Monetarist Economics: What do the German Finance Minister, the Chinese Government, Narayana, and Sarah have in Common? What do the German Finance Minister, the Chinese Government, Narayana, and Sarah have in Common? 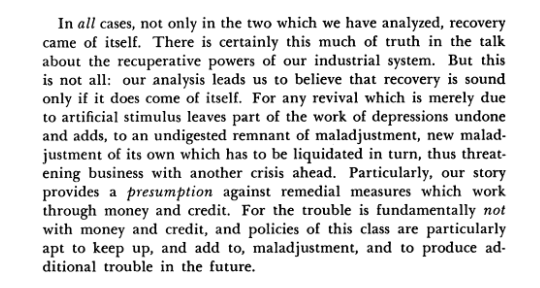 Now, Krugman claims that Schumpeter was long ago discredited, but this passage is not totally crazy. Schumpeter is telling us that caution in policymaking can be appropriate. We can do more harm than good by intervening to slow down adjustments that will have to occur in any event, and sometimes allowing events to take their course can be the best strategy. Clearly, this need not always be the case, but as a general principle, it's hard to argue with it. 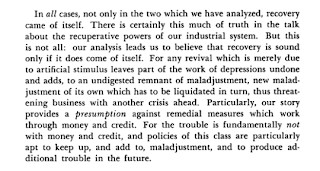 Schumpeter also states, presumably also as a general principle, that "the trouble is not fundamentally with money and credit," and that I would argue with. Obviously, we don't have to look any further than the recent recession to find an episode where money and credit seem to have been important elements in what was going on. However, one could make a case that what currently ails the US economy - principally dismal performance in the labor market - has little to do with money and credit, and monetary invention will do little, if anything, to cure the problem, whatever it is. There is a lot we do not know of course, and there may be something going on that we do not understand about how financial ailments interact with labor market ailments. Who knows? But here we are, in 2010 — and something very much like that position is being forcefully advocated by Wolfgang Schauble, the government of China, Narayanan Kocherlakota, and Sarah Palin. I’ve talked about three possible tools—lowering the IOER, strengthening the forward guidance in the FOMC statement, and quantitative easing. As I mentioned earlier, Chairman Bernanke observed in his August 27 speech that each of these tools has benefits and drawbacks that must be balanced against each other. With QE, I would say that the multiple novel effects make the calculus even more difficult than usual. Before coming to that conclusion, he has some thoughtful things to say about quantitative easing and its possible effects, using available economic theory, and framing the debate in terms a lay audience should be able to understand. Basically, he's saying that we have some theory and empirical work to bring to bear in understanding what QE might do, but there is an awful lot that we do not know. There's not much in there to disagree with, and it's far from Dark-Ages economics. Hey, sorry for the offtopic. By the way, as a former fan of krugman, I must say that the post he wrote the other day about what is difference between conservative and liberal economists and fighting the homo oeconomicus straw man was for me a turning point. He was just behaving stupidly. If Krugman's game is obvious to everyone, I guess there is no good reason to write about it. 1. Yes, I was talking about Shimer's work with Andolfatto the other day. Shimer's point is that real wage rigidity can give you jobless recoveries. The key problem seems to be in the measurement of real wages. It's a hard problem to even sort out in the data whether real wages are procyclical or countercyclical, due to composition effects. 2. Yes, Krugman seems to be very proud of his paper. I have not read it yet.